Editor’s Note: Phoenix Mayor, Greg Stanton, is focused on creating an innovation-based-economy. To promote this, Mayor Stanton created the PHX Innovation Games which invites students, entrepreneurs, developers, designers and hackers to create a better future for Phoenix – one idea at a time. Last October Mayor Stanton released a call for innovators to submit design concepts for the streetscape around the City’s next proposed Valley Metro light rail station — near 48th and Washington streets — which has since been approved and is currently in design stages. Dig Studio, a local landscape architecture and urban design firm, submitted and won the competition. We asked them to share their project and tell us about their concept. Here’s what they had to say. At Dig Studio, we explore the potential that every project holds to make a positive impact on its users and the environment. We believe that thoughtful design is essential to the health and well-being of the community. The places that we create should encourage inclusivity, diversity, activity and a sense of belonging to promote positive social interaction and environmental stewardship. Our concept for the transit-oriented design of the proposed light rail station near 48th Street and Washington Street focuses on access and inclusion. This will be not achieved by designing a better ramp or handrail, but rather by creating a plaza-like station that makes accessibility about feeling free, confident, and one with the community. This design prioritizes accessibility until it becomes invisible and indistinguishable from urban placemaking. The ‘table-top’ approach calms traffic and opens up the entire stop to pedestrian circulation for all individuals. 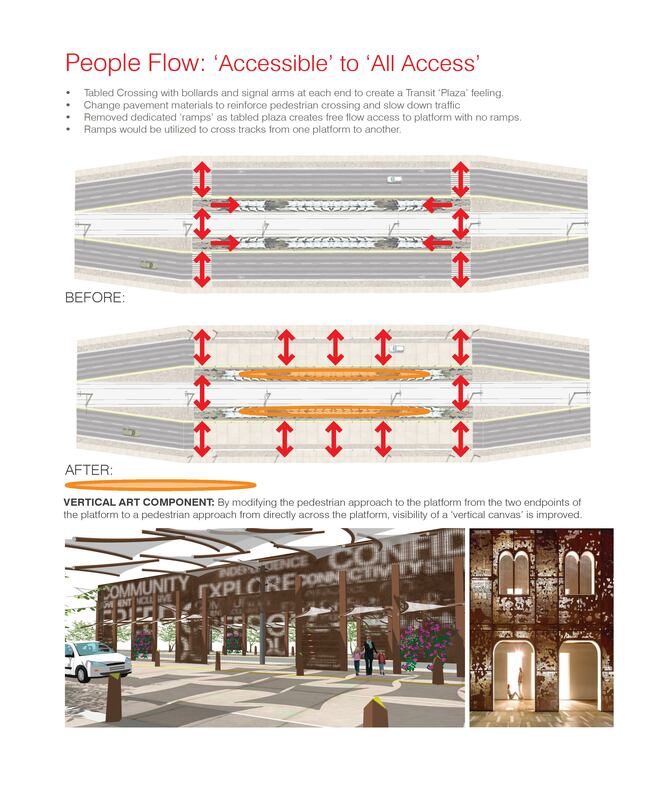 Furthermore, shifting the approach in this way highlights the components of the stop and creates an art opportunity that is about the pedestrian and not the car. Panels can be integrated throughout the structures to the point they are engulfed in a ‘super graphic’ that speaks to the ethos of this station. Tabled Crossing with bollards and signal arms at each end to create a Transit ‘Plaza’ feeling. Removed dedicated ‘ramps’ as tabled plaza creates free flow access to platform with no ramps. Ramps would be utilized to cross tracks from one platform to another. Tabled Crossing allows for the runoff to cross a flush curb, funneling into planting areas that can act as bioswales. Captured rainfall gives and extra burst of water for the trees in these areas, this accelerates growth and thus provides more shade more quickly. Shade canopies that are built off of the existing transit design module. Integrated solar fabric to help offset energy consumption and provide power for items such as charging stations and interactive lighting elements that can alert riders when the train is approaching or brighten to light walkways after the train has left. Trees receive added runoff rainwater, so growth is accelerated and shade canopies are established quicker.